Paris l’été, mid 19th century. 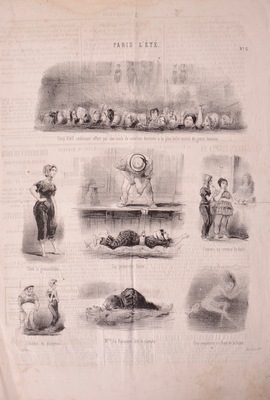 A contemporary of Daumier, Armand-Louis-Henri Telory, known as Henry Emy, worked as an illustrator for several French newspapers. Here, he depicts humorous vignettes of middle class bathers; some are just learning to swim, while another has an unexpected encounter with aquatic wildlife. Still others seem more interested in showing off their stylish bathing costumes or patronizing the snack bar than actually getting in the water.